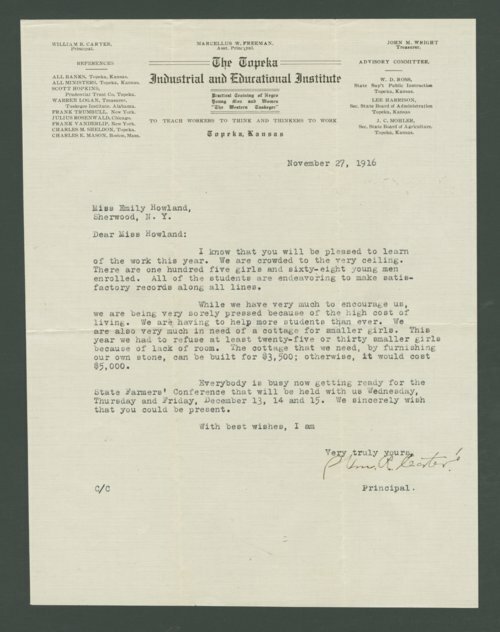 A letter from William R. Carter, principal of the Topeka Industrial and Educational Institute, Topeka, Kansas, to Emily Howland, Sherwood, New York, educator and suffragette. Carter writes about the over crowding at the Topeka Industrial and Educational Institute, and their need of more living space for smaller girls. He tells Howland that they had to refuse at least 25 or 30 smaller girls because of the lack of room, and they can build their own stone cottage for $3,500; otherwise, it would cost $5,000.